McKinney City Hall is located at 222 North Tennessee Street, McKinney, TX 75069; phone: 972-547-7500. Photo: Board-Everett House, ca. 1887, 507 North Bradley St, McKinney, TX 75069. Listed on the National Register of Historic Places in 1987. Photographed by User:Renelibrary (own work), 2012, [cc-by-3.0 (creativecommons.org/licenses/by/3.0)], via Wikimedia Commons, accessed November, 2012. 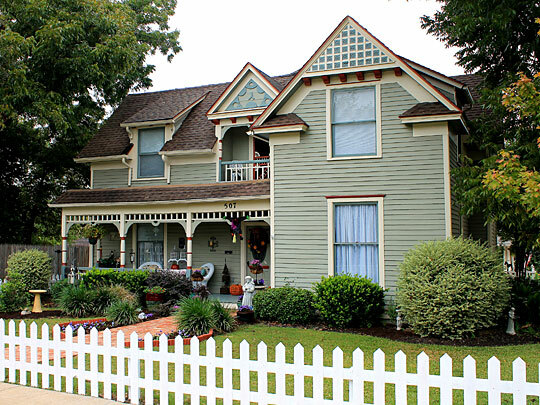 A 2010 Money Magazine article named McKinney number 5 on its list of Best Places to Live in the U.S.
McKinney's founding came soon after Collin County was organized in 1846. Buckner, a small village which once stood in the western part of the county about four miles northwest of present-day McKinney, initially served as county seat. State law, however, stipulated that each county's government be situated as near as possible to the county's geographic center. Upon learning of this requirement, local officials realized that a more centrally located county seat was needed. William Davis, a prominent landowner in the area, donated 120 acres for this purpose and George White and Ethelred Whitley surveyed the new town site. Named for Collin McKinney, an early Texas settler, patriot and statesman, and also the person for whom the county was named, the town was officially established on August 24, 1849, when the first lots were sold. Buckner soon was abandoned. A Texas Historical Commission subject marker notes its site. McKinney stands on gently rolling prairie land which when first settled, featured expansive fields of waist-high grass. Although no rivers or major tributaries run nearby, several seasonal streams flow through the city. These streams served as a source of water for pioneers, and the native trees that lined these waterways provided an early source of building materials. The original town site presented a cardinal-point grid plan with a courthouse square near the city's center, a popular town plan throughout Texas. The majority of the state's county seats, especially those of the same vintage as McKinney, are arranged similarly. The courthouse square was the sole public space set aside in this town plan. Anticipating that property near the town's center would be in great demand for business purposes, the city's surveyors made lots facing onto the courthouse square long and narrow, measuring 25 by 100 feet. Such a layout enabled merchants to erect buildings with storefronts for displaying their goods to passersby and room within to conduct business and stock their merchandise. White and Whitley divided the remainder of the city's blocks into equally sized lots that were reserved for residential use. During McKinney's pre-railroad era, the town was sparsely developed, even around its square. David Moore, Historian, Herdy-Heck-Moore, Inc. for the City of McKinney, Historical and Architectural Properties in McKinney, Collin Count, Texas, nomination document, 1987, National Park Service, National Register of Historic Places, Washington, D.C.